Rising from an underwater mountain chain (the Northern Line Islands) a thousand miles south of Hawaii, Palmyra is actually a collection of about fifty little islands and islets circling three lagoons and surrounded by 16,000 acres of coral reefs. The entire land surface is less than five square miles with a maximum elevation of seven feet, and twice every day the tides expose and then hide long coral reef flats. No one lives there permanently, but a bazillion sea birds and crabs call it home. 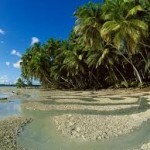 Palmyra is jointly owned and managed by the Nature Conservancy and the U. S. Fish and Wildlife Service; the atoll is a national wildlife refuge. 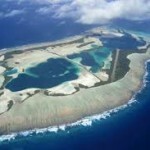 In 2009 Palmyra, like Wake Island and numerous others, was included in the Pacific Remote Island Marine National Monument with protection to fifty miles out. 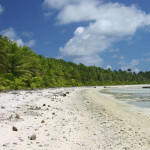 The Palmyra Atoll Research Consortium studies the effects of climate change, coral reef health, and invasive species on this unique, isolated, and pristine environment. In 1802 the captain of the American ship Palmyra was the first to officially report and fix the position of the uninhabited atoll (thus the name) and its history is layered with shipwrecks, mysteries, rival claims, and multiple owners. Hawaiian King Kamehameha IV dispatched a ship to claim Palmyra in 1862, and it had passed through several private owners when the United States annexed the Hawaiian Islands – including Palmyra – in 1898. 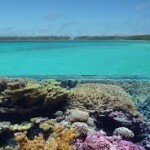 The Fullard-Leos family owned most of the atoll during the twentieth century, with the exception of the World War II years, and Nature Conservancy bought it from the family in 2000 for $30 million. As I write in Building for War, the U. S. Navy began to recognize the strategic value of the remote Pacific islands in the mid-1930s as tensions with Japan rose. The Navy laid claim to the islands and in 1939 contracted with Contractors Pacific Naval Air Bases (CPNAB) to construct naval air stations. 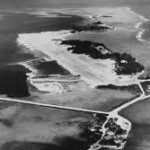 Palmyra was one of the first CPNAB projects in a program that would grow to include a dozen major Pacific installations, including Wake Island. As a coral lover, I cringe when reading accounts of prewar reef blasting to cut access channels at the Pacific atolls. In his 1946 book Builders for Battle, David O. Woodbury describes the initial exploratory mission to Palmyra in November 1939: “This pioneer exploring was really the best fun of the whole project, and Ernie loved fun, especially banging away at a coral ledge with dynamite. Bundling a couple of sticks of gel together, his Kanakas would string a wire to the plunger box and scatter, then watch water and solid chunks hurl themselves into the sky. When everything had come down again, they waded back to see what damage they had done.” When the job was fully underway a couple of months later, work parties deployed across a half mile of reef, drilled six-foot holes in the coral twenty inches apart and loaded them with dynamite, wired together so that when the end one was blasted “the entire row would go off like a string of firecrackers . . . This was the payoff for the long day’s grind, and the Kanakas would stand clear and yell joyfully as the rock and bits of iron reached for the sky.” Repeating the process many times they blasted a forty-foot wide trench into the lagoon. Later dredging would bring up coral “muck” to use as fill to connect the small islets and to crush for the 2000-foot long land runway. Palmyra Naval Air Station was commissioned in August 1941 and fortified with a garrison of Marines. Work continued on the runways, seaplane facilities, and defense installations. When war came to the Pacific in December 1941, Guam, Cavite (in the Philippines), and Wake Island fell to the enemy, but their fellow CPNAB projects on Palmyra, Johnston, Midway, and American Samoa remained under the American flag. All were shelled, but all survived. On December 23 a shell from a Japanese submarine hit the contractors’ dredge on Palmyra. Within a week the Navy evacuated 112 CPNAB workers to Honolulu; the remaining 240 stayed on to finish the work. Seabees would continue construction work during the war years, but the naval air station was demolished after the war. Palmyra observers say the atoll has recovered from the years of Navy use (and abuse), though the black rats that stowed aboard the Navy cargo ships and scurried onshore had far greater long-term impact. The rats multiplied and flourished for decades, feasting on eggs and seeds and undermining the web of life on Palmyra. However, a recent rat eradication program has been proclaimed a success and scientists are noting dramatic signs of species revival. The human touch is heavy on Palmyra in Syria, but it is light on the other Palmyra. Both places have important lessons to teach us about life on our planet.